In Pursuit of My Own Library: What magician type would you be? My drizzly weekend continues to provide payouts for this week's reviews. I was able to start another fabulous series in the steampunk genre, and I fell in love with the magic system. In honor of The Glass Magician releasing today, I will be doing a double post. But let us start at the beginning--and what a wonderful beginning it is. Great system of magic. Great treatment of steampunk; Victorian England without the zany clockwork and gears, just a splash of magic, and no actual historical figures involved. No muddying of the historical waters. Three cheers! I don't think I can be entirely spoiler-free, but I promise my review does not give away any ending clues, just a wee little plot point, but it is just so cool. As an author, it must be incredibly difficult to come up with something new and exciting to catch reader's attention. Especially in this day of mass media. I really found the spell to trap Ceony in a heart (and her pursuant travels through the chambers to escape) brilliant--and somewhat wonderfully, disturbingly researched with anatomical correctness. A little squeamishness was a nice addition to my Halloween weekend. What would it be like to see inside and walk the paths of the person we care about? Ms. Holmberg took a turn at plotting it out for us. I also very much enjoyed the concept of magic introduced. We are able to bond and therefore control any element that is created by man. In the first novel, we are introduced to glass, metal, rubber, plastic, and paper. These are your good, wholesome magicians who make excellent inventions to help out people. They imbue an already pretty nifty invention with just a touch of something extraordinary to lift the creativity. 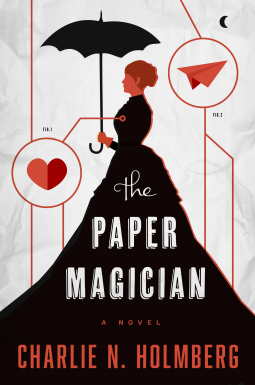 I was enthralled with the creative imagination of what paper magic would be like. I would love to be a Folder. Then we meet the dark side of magic--Excisioners. These are individuals who have bonded to flesh. Some wonderful concepts arise in the novel and the dilemma of the choices we make. Are they inherently bad people for the choices they make? Do we make the entire practice illegal and lock them all up without the key? Questions that we will get to delve into even deeper in The Glass Magician, so make sure you read The Paper Magician now to be ready for the release today. This novel stretched the imagination and had moral thinking. There is some serious goodness crammed in between the covers. I give the novel 5 stars. The action moves quickly and the plot feels new and refreshing. I cannot recommend this novel enough. Check back later this afternoon for my second review.